"If history is a record, the art of today locates itself in its scratched and skipping grooves." Inna Babaeva, More Than You Think, 2011. Softwood lumber, PVC clear sheets, casters, 64 x 90 x 40 in. Kris Chatterson, Untitled, 2011. Acrylic, UV inkjet on polyester over panel, 40 x 30 in. 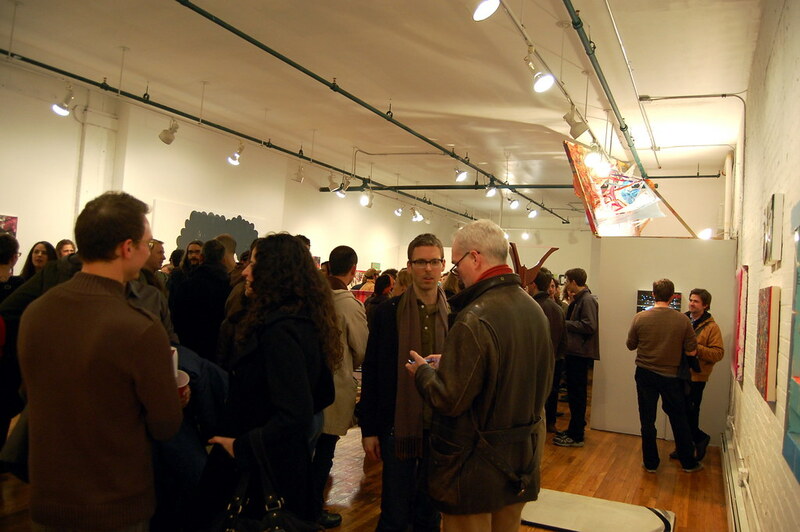 Organized by Progress Report, the curatorial nom de guerre of artists Kris Chatterson and Vince Contarino, the exhibition includes 32 artists whose interests tilt toward the extroverted, ebullient (though not necessarily emotionally expressive) end of the available abstract spectrum, of the historical record to be sampled and sliced apart. There is, for instance, an effervescent Keltie Ferris canvas, its eerie black ground bedecked with primary-color polka dots, a madcap Mondrian. A small square by Matt Deleget — titled Shuffle (for Grandmaster Flash), a tribute to the hip-hop legend who grew up in the surrounding community — contains far more punch than one would expect from a painting just 18 inches on each side. Filled with bright squares of pink, yellow, and orange, it holds up well against its sprightly neighbor, a Cordy Ryman put together with just a few wood blocks. 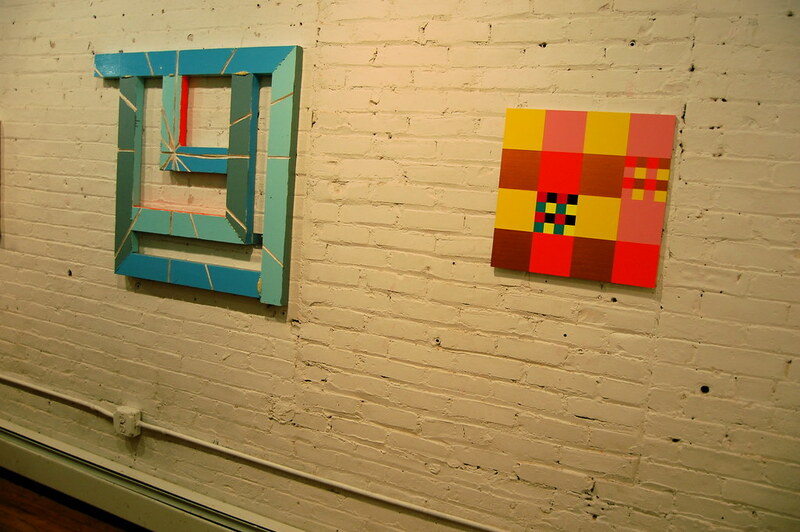 Left to right: Cordy Ryman, Vector, 2010. Enamel, shellac and epoxy on wood, 36.25 x 33.5 in. 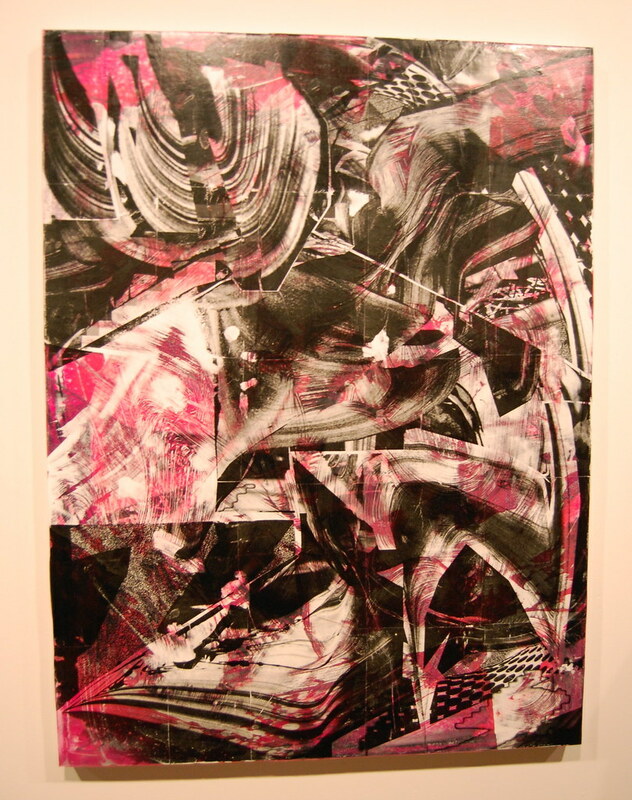 ; Matthew Deleget, Shuffle (for Grandmaster Flash), 2011. Acrylic, fluorescent and metallic acrylic on MDF, 18 x 18 in. 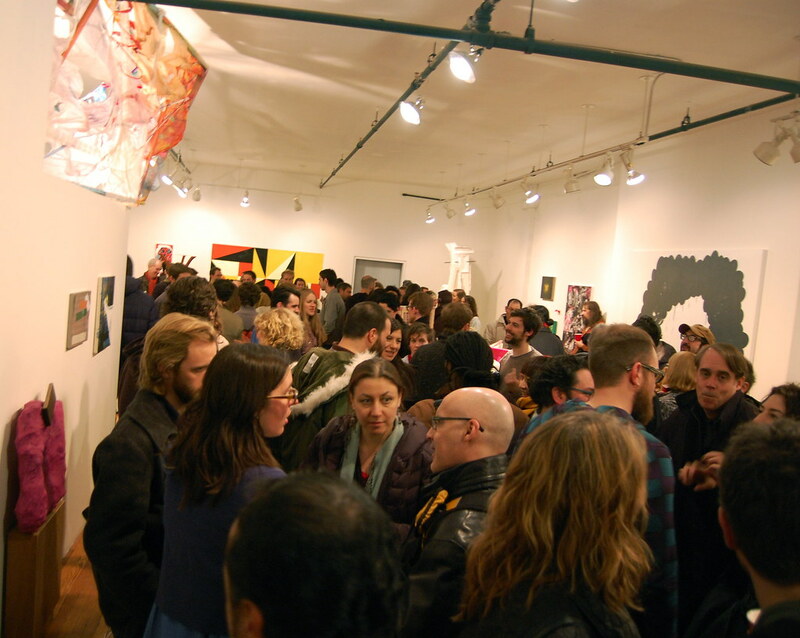 It's a strange thing be in the neighborhood of Grandmaster Flash, just a few blocks from the late and legendary Fashion Moda, looking at contemporary art by artists whose work one usually sees in Chelsea, on the Lower East Side, or out in Brooklyn. Strange, but nice, with friends and acquaintances brought together en masse in a new context. Perhaps you have seen Joy Curtis's architecture–bewitched show at the Klaus von Nichtssagend Gallery, open through Sunday, and want more. You will find it here, a sculpture of what look like roughly splintered white wall moldings that have been strung them together and hung from the ceiling. 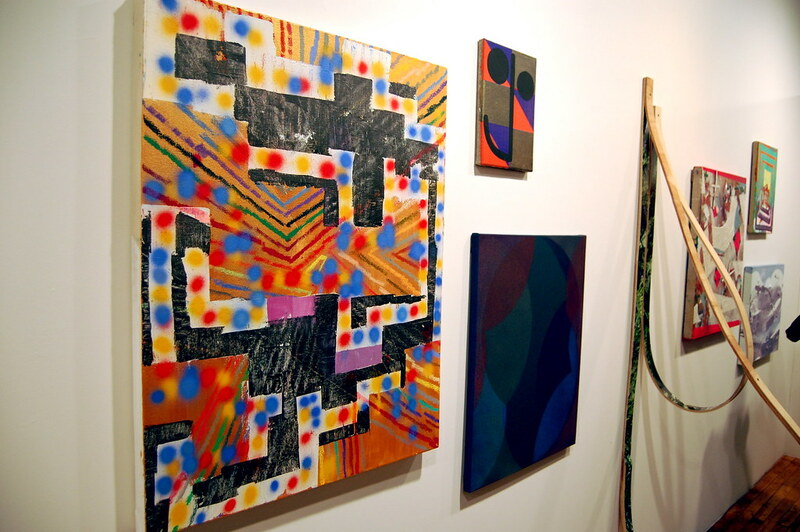 Two of her gallery compatriots are here too, Ian Pedigo, a maker of inscrutable assemblages and arrangements, and Pamela Jorden, who produces deceptively simple abstractions, patches of color that threaten to cohere but never quite do. Joy Curtis, St. Virga, 2010. 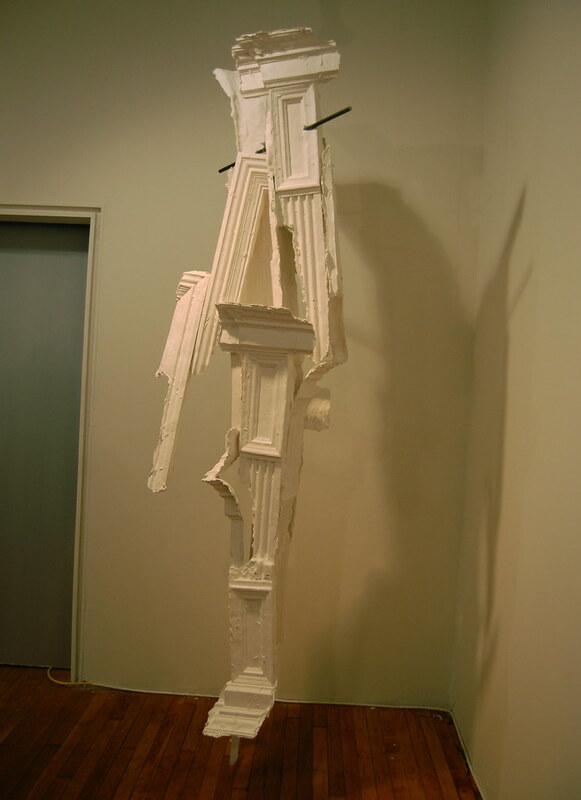 Hydrocal, fiberglass, wood and metal, 98 x 21 x 21 in. Tisch Abelow, Untitled (very tizdayle), 2009. Gouache on paper, 68 x 82 in. Joshua Abelow, who closed out a winning show at James Fuentes in February, is another welcome guest, represented by a tiny and typically witty painting called Self Portrait — the promise of its title fulfilled by just two circles and a single line against a geometric background. 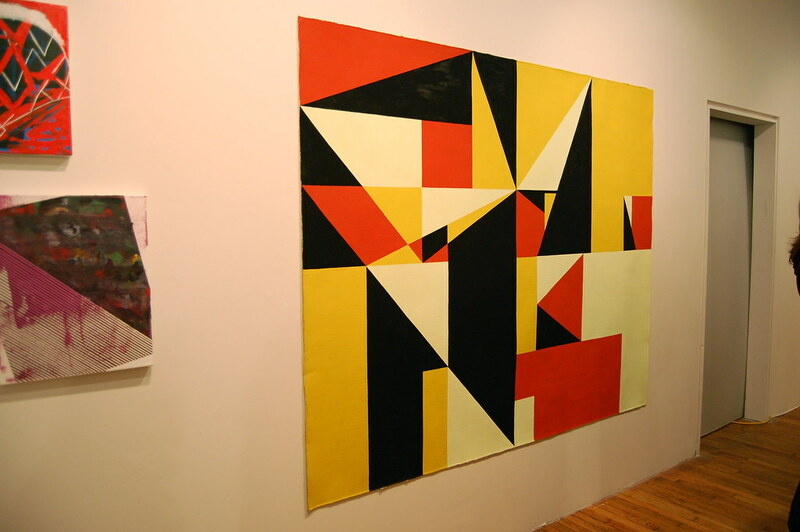 His sister, Tisch Abelow, has work on display as well, an enormous painting that looks like — and very well could be — a magnified detail of a James Siena, triangles folding in on each other. Lauren Luloff's piece is comparably mysterious, harder to classify. 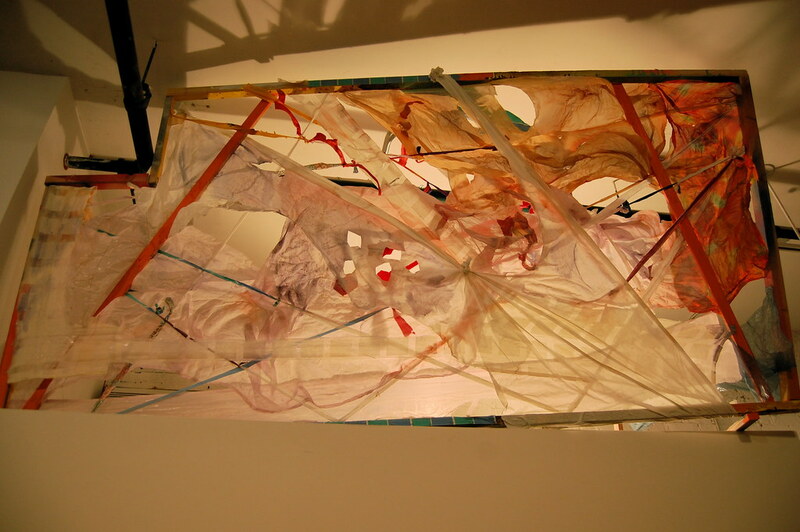 A wood rectangle covered with a web of translucent fabrics and strings, it's balanced precariously on the top of a low drywall. Its unwieldy, almost-organic masses of material look prepared to crawl out into the room, perhaps to join together with Inna Babaeva's More Than You Think, a series of wood frames on wheels that she has wrapped in streams of neon fabric. Dennis Hollingsworth, Todo es Igual, 2011. Oil on canvas, over panel, 32 x 24 in. ; Gary Petersen, Step Up, 2011. Acrylic on panel, 20 x 16 in. Ian Pedigo, Untitled, 2010. 76 x 60 x 30 in. 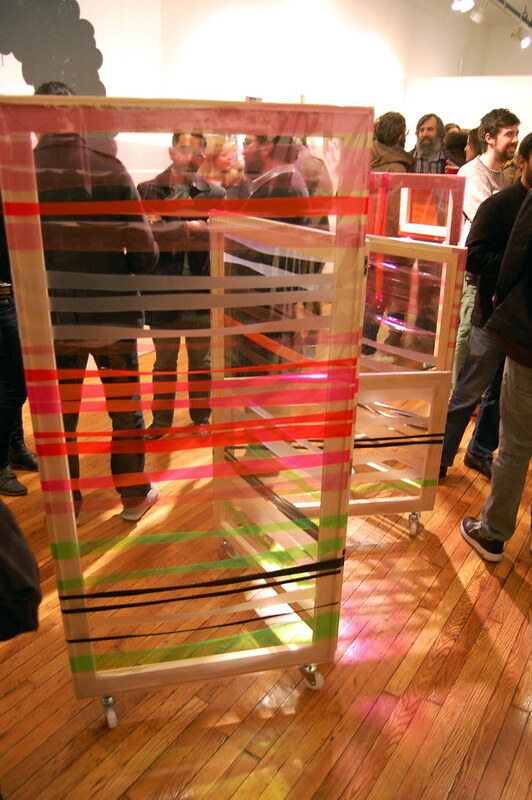 Lauren Luloff, Buoy Gallery Installation, 2010. Mixed media, dimensions variable. 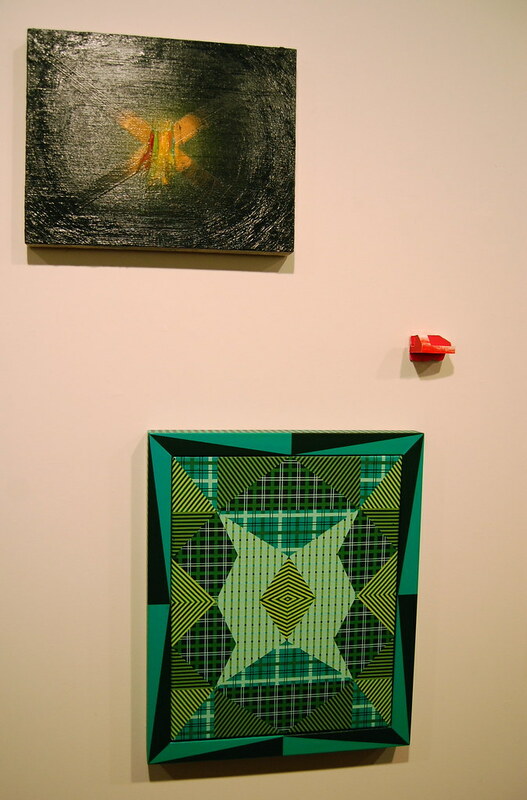 Center: Letha Wilson, Double Dip, 2009. Wood, digital prints, 80 x 5 x 38 in. 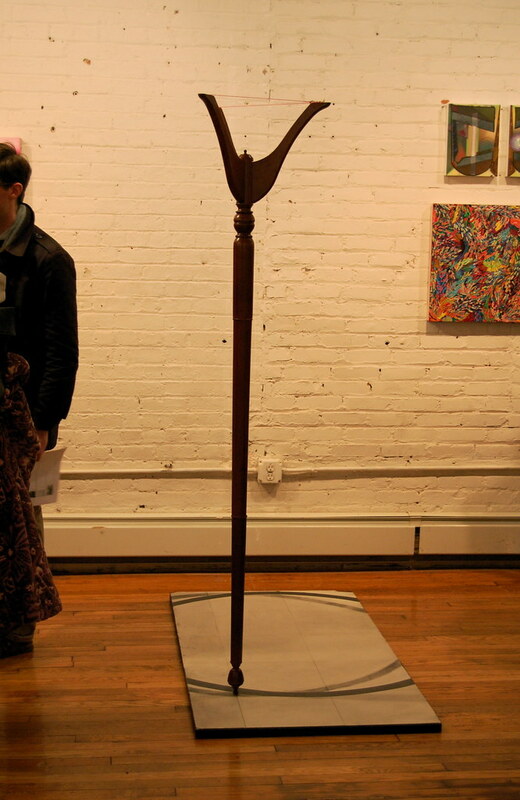 ; right: Patrick Brennan, The Mountauk Discussion, 2010. Materials, 24 x 18 in. 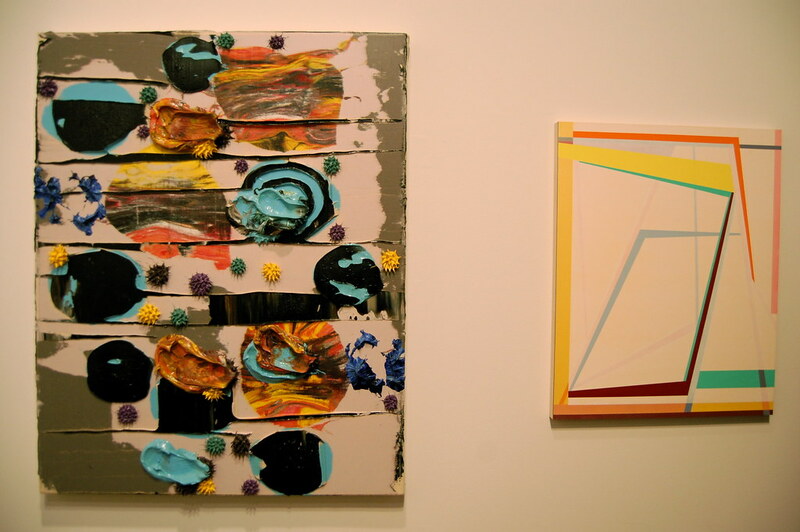 Picking definite favorites, clear winners, in a show with this many artworks is, of course, a fool's game, but here's one pick: Letha Wilson's Double Dip. 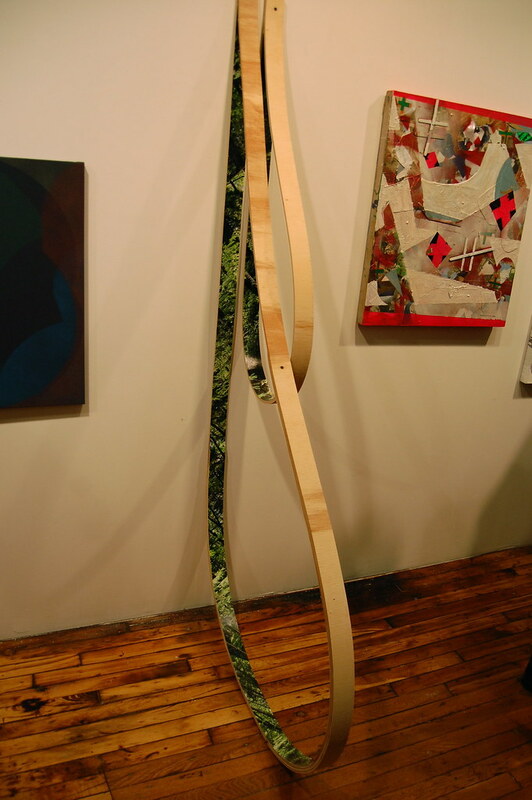 She's gently bent two thin strips of wood — one large, one small — into gently curving loops and lined their interior faces with photos of lush greenery. A forest grows inside of them. I want to see one hanging next to a Robert Morris felt piece. If anything in "The Working Title" ages as well as those felts, if anything is being discussed 30 years from now, it will mean that quite a few of these pieces will have survived and won. People just may one day look at the checklist listing these fairly young, fairly brash abstract artists and marvel that all of their private languages were once chattering away together in a space in the Bronx, lobbying for their causes, fighting it out. Right now, it feels like a whole — albeit loosely knit — movement is up for a vote. 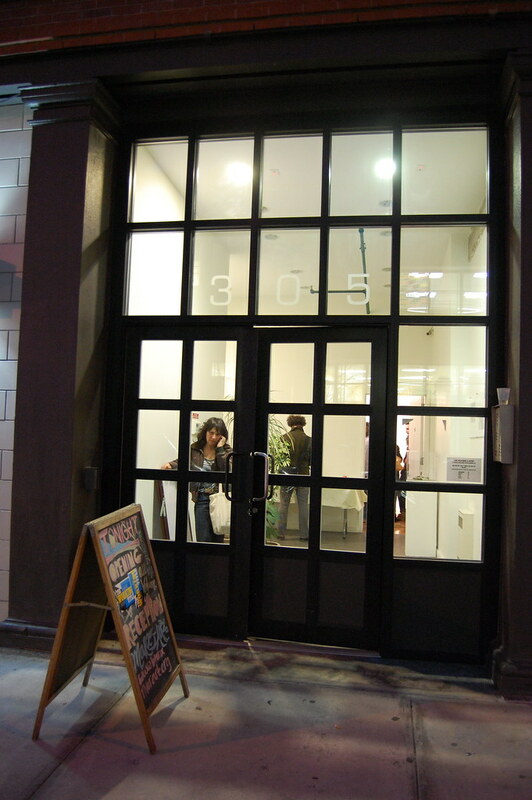 The front of 305 East 140th Street, #1A, in the Bronx, the present home of the Bronx River Art Center, but just for a bit.